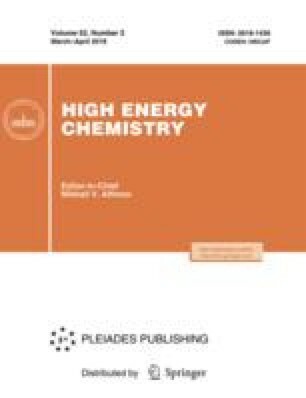 A mechanism is proposed for the formation of hydrogen peroxide in an electrolyte-cathode atmospheric-pressure direct-current discharge. A local increase in the temperature of water in the area of liquid contact with the gas discharge causes its boiling, and strong electric fields due to unevenness of the turbulent surface appear on the splashes. As a result, a local breakdown of the hemispherical region of boiling water beneath the electrolyte-cathode spot is possible. The kinetic scheme of the reactions for water vapor plasma has been considered, and hydrogen peroxide concentrations have been calculated, the calculation results being in satisfactory agreement with experimental data. Original Russian Text © E.S. Bobkova, A.V. Tatarinov, E.V. Ivanov, P.A. Gushchin, 2018, published in Khimiya Vysokikh Energii, 2018, Vol. 52, No. 2, pp. 154–164.